alchemy \al-kə-mē\ : The power or process of transforming something common into something special. Alchemy Distillery is located in Humboldt County, California. Please click on the banner at the top to learn more about "Our Grains." Our spirits are distributed locally by Humboldt Beer Distributors -- a family owned business since 1973. We are proud to say that all of the equipment in our distillery is Made in America from our boiler, still and cooker all the way down to our bottles and corks. We have been extremely fortunate to be part of such a supportive community! Our first business, Alchemy Construction, has been flourishing in Humboldt County since 1998. Thanks to our fellow community members, we were voted "Best Construction Company" in 2014, 2015, 2016 and 2017! Now our Distillery is community supported as well! From our highly successful Kickstarter campaign and local press, to stores, bars and restaurants carrying our products! We are proud to be Arcata's first and only craft distillery! 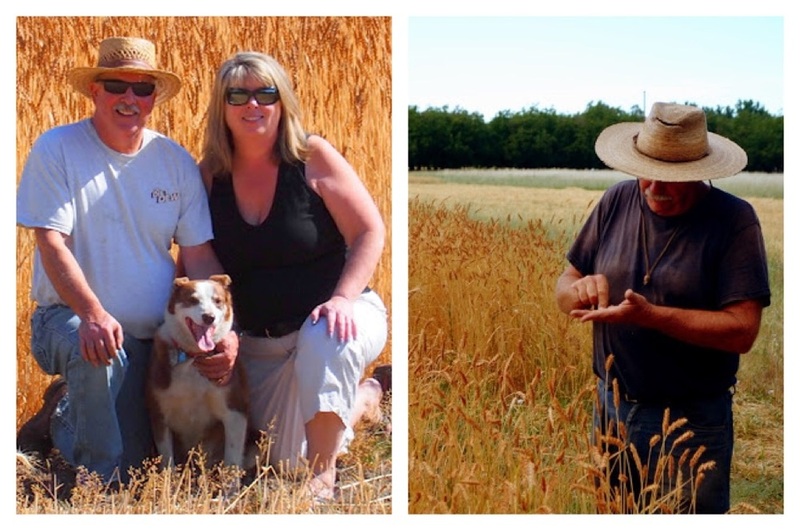 We get all of our wheat and rye from farmers right here in Humboldt County! On the left is Laurence & Lisa Hindley of Hindley Ranch (with Princess Reba). Their farm is in the Mattole Valley, 80 miles from our distillery. On the right is John Laboyteaux of Camp Grant Ranch. 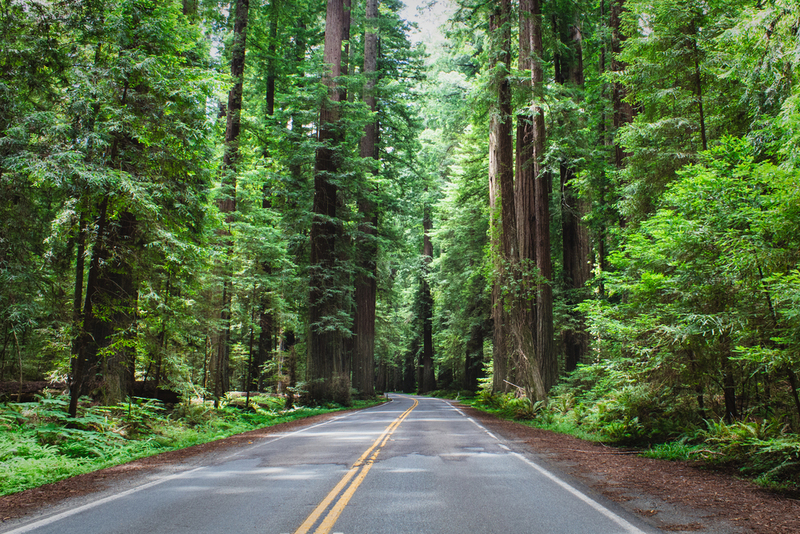 John's property is in Southern Humboldt along the avenue of the Giants, 36 miles from our distillery. Our focus is “grain to bottle" spirits. We source fresh grains, mill them on site, then add pure filtered water and yeast. We ferment and distill this “mash” on American made equipment. This liquid is aged in barrels or bottled for immediate enjoyment. You will never find Neutral Grain Spirits (NGS) in our Distillery. Many distilleries purchase mass-produced liquid NGS from major distillers and bottle it as their own spirit. Look for the term "distilled and bottled by" on spirits bottles and you can be confident they are not using NGS. We are thrilled to be working with Demptos Napa Cooperage for all of our barrels. Located just 265 Miles South of our distillery, in Napa, CA, their quality is exceptional. Demptos uses sustainably-harvested American Oak which they air dry, rather than kiln dry. They char their barrels with a small bon fire made from the same American Oak... not propane. We believe the term "craft distilling" means using raw materials to create a high quality distilled spirit in small batches. Some larger distilleries have mislead customers by claiming their mass-produced spirits are "craft distilled." This has led to lawsuits. Here at Alchemy Distillery, we are actively involved in every stage of production. We highly regard our relationships with our suppliers, distributors, retailers & customers. Our spent mash is highly nutritious for pigs and they clearly think it is delicious as well! We divide our tasty mash between two local pig farmers. We strive to be a Zero Waste facility and donating our spent mash is an important step towards that goal! An added benefit of this partnership is these two farmers regularly give us fresh eggs from their farms and have also given us whole pigs! Amy is a vegetarian but Steve is NOT so he is literally in pig heaven. Did you know all Bourbon is Whiskey but not all Whiskey is Bourbon? Here are the legal requirements to call a Whiskey Straight Bourbon. • A minimum aging requirement of 2 years. Whiskey starts out clear as water! Our first product on the market is un-aged Clear Whiskey straight out of the still. During the barrel aging process the “Clear” Whiskey will interact with the charred barrel wood. This process greatly influences the color, taste and smell of the finished product. A portion of the aging spirit evaporates through the barrel and into the air. This is called the “angels’ share” and the scent is pure heaven. We look forward to offering tours of our barrel room so you can experience this for yourself. Amy Bohner is a California native who migrated to Humboldt County in 1992 to live "where the forest meets the ocean." After attending Humboldt State University, and spending a decade doing social work, Amy met her future husband Steve. In 2004 she joined his company, Alchemy Construction. Amy and Steve hope to continue their success as a team by starting this second business- Arcata’s first distillery. Amy is a proud "woman in business" and a strong participant in her community. Her volunteering spans over two consecutive decades between Humboldt Women for Shelter, Big Brothers Big Sisters, The Rotary Club of Arcata Sunrise and Six Rivers Planned Parenthood and Mountain to the sea Wilderness Camp. During rare time away from the Alchemy projects, Amy enjoys hauling their 1977 Vintage painted Airstream around the Country. Steve graduated from Humboldt State University in 1995. He paid his way through Humboldt State University by working in the local lumber mill pulling Green Chain. That led to his first job in the construction field. In 1998, After 10 years experience, Steve got his contractors license and started Alchemy Construction. At the time he only had $500 in his bank account, a few tools, an old Nissan 4x4, and his faithful dog Kira riding along in the front seat. Voted Best Construction Co in 2014 and 2015, Alchemy Construction's strengths include sustainable building techniques, radiant heating, solar, concrete countertops , polished concrete floors and distillery build outs! In March 2014 we launched a Kickstarter campaign. 403 people contributed over a period of 30 days. Half of the money raised was immediately invested back into 15 independent Humboldt County businesses by purchasing rewards locally. The remaining funds went towards the balance due on our American made still by Vendome Copper and Brass Works in KY! You supported our dream from the beginning and you will always have a place in our hearts! Cassie Forrington - Boujie Baking Co.